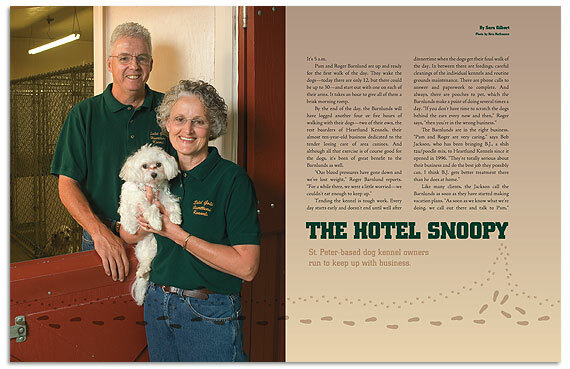 ST. PETER-BASED DOG KENNEL OWNERS RUN TO KEEP UP WITH BUSINESS. By the end of the day, the Barnlunds will have logged another four or five hours of walking with their dogs—two of their own, the rest boarders of Heartlund Kennels, their almost ten-year-old business dedicated to the tender loving care of area canines. And although all that exercise is of course good for the dogs, it’s been of great benefit to the Barnlunds as well. Heartlund Kennels began as a part-time project for Pam Barnlund, a former hair stylist. After 25 years in the salon, she started having reactions to the chemicals in the colors and perms she handled every day. She needed a change, so she asked her husband to help her find something new to do. So was personal attention. Pam’s intention was to get to know every dog coming to the kennel and giving each one the specialized care necessary. Special diets? No problem. “Some have kibble, some have cottage cheese, some have chicken parts,” she says. “Whatever I have to mix up, I’ll do it.” She also gives medicine (B.J., who is diabetic, gets regular insulin shots) and brushes their hair before their owners come to pick them up. Heartlund Kennels opened in May 1996. The Barnlunds had done only minimal advertising—a notice in Home Magazine and posters in local businesses. “At that time, we were happy to have two or three dogs out there,” Pam remembers. She was still working part-time, and Roger full-time. But then word started getting out about their service. As each new client told a friend or two about Heartlund, business picked up. Within two years, Pam had to quit her day job and devote herself entirely to the kennel. Roger helped by walking dogs in the mornings and evenings and taking care of the grounds as he could, but he continued to work full-time at Roadway in Mankato until retiring in 2003. Five years after opening Heartlund Kennels, the Barnlunds had to double the original 15 runs to accommodate their growing clientele. Five years later, they’re preparing for another expansion that will both upgrade their existing runs and increase the total by seven. They’ll also add space to store their stocks of Solid Gold dog food products, which they distribute around the region. Their success is directly related to the time and energy they put into their business. Pam often crashes by 9 p.m. after spending all day on her feet with the dogs, leaving Roger to answer the calls that come in at 10 p.m. or later. And in the ten years since they opened the kennel, they haven’t closed it once to take a vacation. The last time they traveled together—a weekend trip to Illinois for a wedding—Pam spent most of her time on the phone to her daughters, who were running the kennel. So far this year, the Barnlunds have hosted dogs from 527 families, some for just a few days and some for a matter of months. Pam knows each of them by name and can recall by memory exactly how each animal prefers to be treated. That’s especially important for their repeat customers—which is almost all of them. Their clients appreciate that attention to detail. Many come from long distances (some from the Twin Cities, others from northern Iowa, and one all the way from Des Moines) because they’ve come to expect top-notch service at the kennel. Most make reservations months in advance, and some even call the kennel before they book a flight. “People call to make sure they can get their dog in before they set up their flight,” Roger laughs. “They make reservations with us before they arrange their vacations.” Bob Jackson even called from the hospital in the midst of a medical emergency, asking them to pick up B.J. and make sure he got his medication. Of course the Barnlunds obliged. Pam and Roger Barnlund come by their affection for dogs naturally. Both were raised on farms— Pam in Madelia and Roger in Donovan, Illinois—and both had dogs of their own growing up. Roger, in fact, raised coonhounds while he was in high school and spent a great deal of time competing with them. He and his dogs traveled from Texas to North Dakota going to competitions. Free Talking Sam, one of his coonhounds, even took the “champion of the night” title at a North Dakota State Hunt. “That was a lot of fun,” he remembers. Ika is a six-year-old German Shepherd who stays out in the kennel with the other dogs. Pixie, a one-year-old Maltese who actually belongs to their 13-year-old daughter Hannah, stays in the house, blissfully unaware of the attention being doled out in the kennel. Solid Gold Health Products for Pets, designed to promote holistic health to animals, was introduced in the United States in 1974. It is made from select ingredients from around the world, including amaranth (which comes from Central America), millet, barley and brown rice. Because it’s all-natural, it is especially effective for pets with allergies or recurrent infections. They’re feeding animals across southern Minnesota and Iowa as well. Currently, they supply at least 25 retailers, including Pet Expo and Me and My Master in Mankato as well as locations in Nicollet, Albert Lea, Montevideo and Redwood Falls. Roger Barnlund starting working for Roadway Express in Chicago in 1970. Six years later he was transferred up to Minneapolis, and a few years later he moved again—this time to Mankato, where he met Pam on a blind date set up by a friend. “It was a good introduction,” he says with a smile. As an operations manager, Barnlund was often working from 6 a.m. until 6 p.m., and going in on weekends too. On top of that, he was getting up at 5 a.m. to walk dogs at the kennel, and then heading out again after he got home. As business began to grow, it came time to make a change. That wasn’t an easy decision for Barnlund, who had devoted 33 years of his life to a company he had grown to love and respect. But just as he was considering the decision, Roadway was sold to Yellow, which decided to consolidate its operations. He could go to either Rochester or Minneapolis—and for one week, he went to Rochester. Now he works fulltime (and then some) at the kennel with his wife, Pam. She likes to remind him that he’s grown just as fond of this business as his previous employer. “You love our business now,” she says.